You are here: Home / Auto / Is Distracted Driving Dangerous? 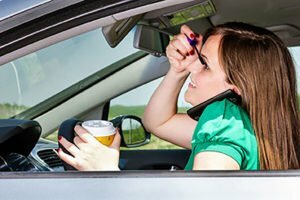 You might think distracted driving isn’t that dangerous. You’d be wrong. In our go-go-go age, it’s very hard to focus on only one task at a time. We get it! We’re all busy, and multi-tasking feels like the best use of our time. That’s all well and good – until you get behind the wheel. When you’re in the driver’s seat, the only thing you should focus on is (surprise!) driving. If you’re not convinced, check out these statistics that highlight the dangerous nature of distracted driving. Most states (46, to be exact) have banned texting and driving. Texas and Missouri have banned inexperienced drivers from texting. Only Arizona and Montana lack texting and driving laws. What’s more, Puerto Rico, the US Virgin Islands, and Guam have all banned texting and driving! When drivers between the ages of 18 and 64 were polled, one in three of them admitted to reading or writing a text message behind the wheel. What’s the big deal? A staggering 26 percent of crashes on the road involve a cellphone. Over eight Americans lose their lives every single day in motor vehicle accidents where the driver was distracted. In 2013, the National Safety Council estimates that 341,000 crashes involved texting and 1.1 million involved talking on a cell phone. They also report that using a cell phone increases your risk of getting into an accident by a staggering 400 percent! Did you know that avoiding distracted driving can help you save money and lives? When you stay alert and aware while driving, you’re significantly less likely to get into an accident. An accident-free driving record can help you score lower auto insurance rates! To learn more about how safe driving practices can help you save, contact McCarty Insurance Agency. We serve drivers in Fresno and the neighboring California cities.